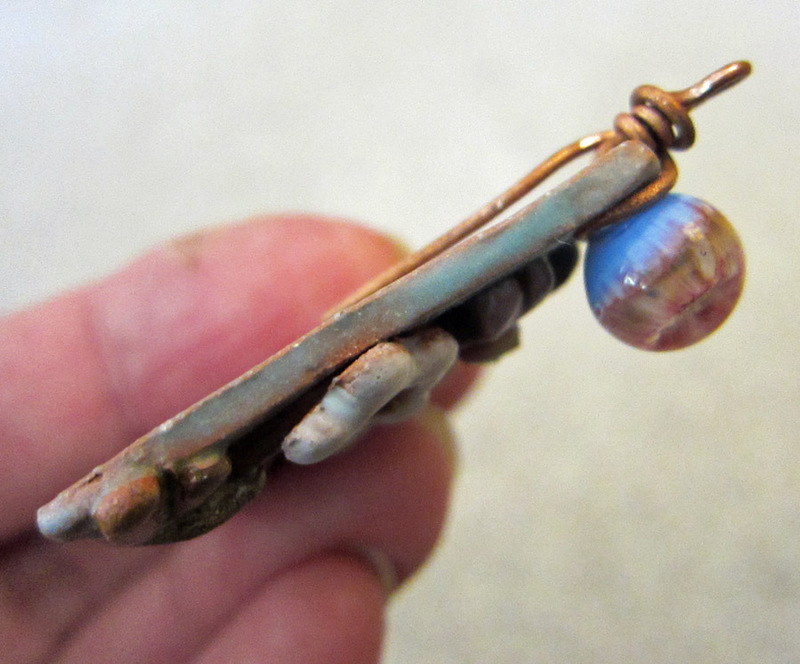 Once a month Art Jewelry Elements hosts a component giveaway and reveal. March’s component was made by the talented Jennifer Cameron of Jen Cameron Designs. Members of the Art Jewelry Elements team, plus three other artists were given 2 gorgeous glass head pins that Jen made for us. 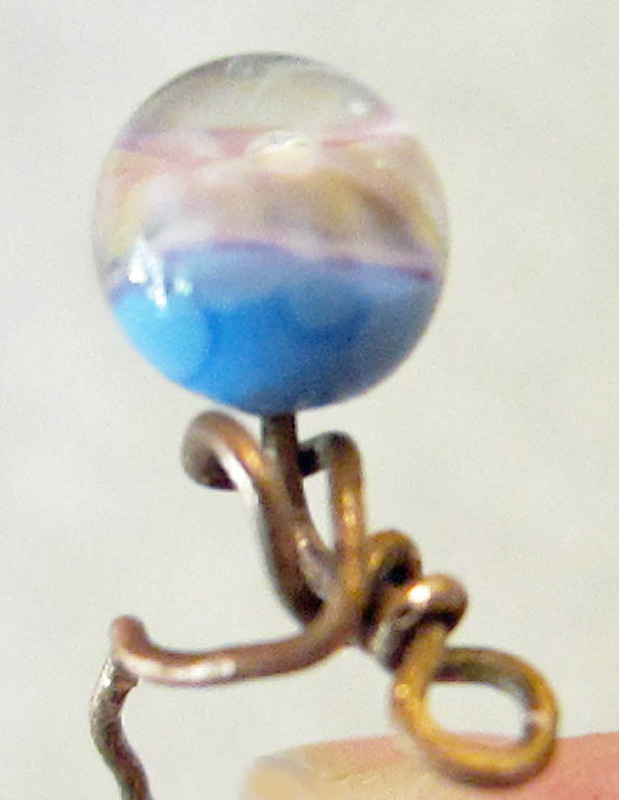 These are basically a long thin copper wire with a ball of handmade glass at the end. 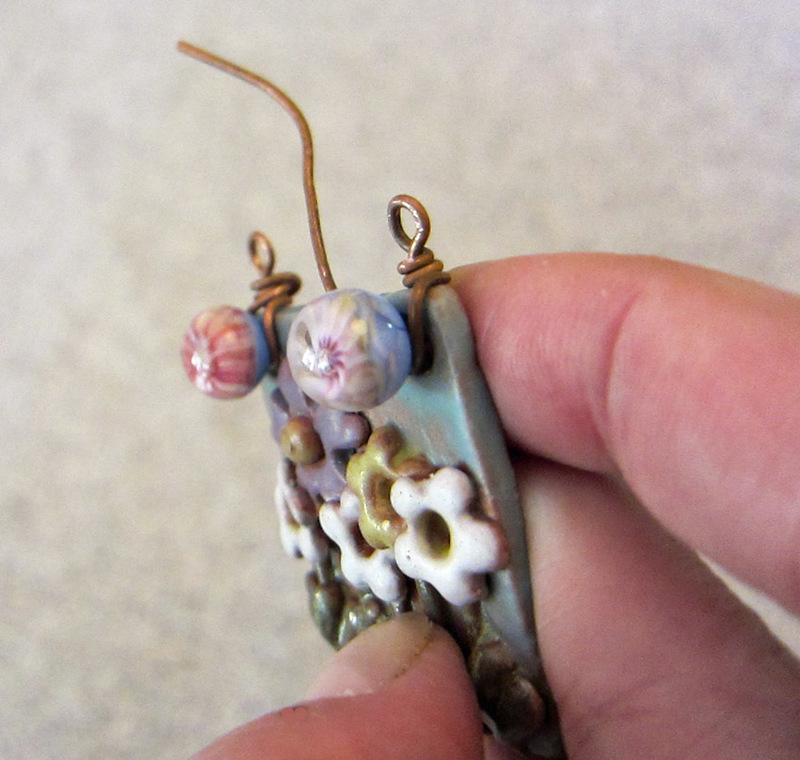 I was so excited to be able to use these with a gorgeous floral pendant that I’d been hoarding for a couple of years. My idea was to thread the head pins through the holes at the top of the pendant and make wrapped loops above the pendant, so it could be attached to a necklace. The first head pin turned out just like I had imagined it! I was so excited about this that I decided to show the whole process step by step, when I wired on the 2nd head pin. Wreckage! I just about cried. I loved this pendant. What followed were a few choice words that I’m not going to print here! Here are the mangled bits of the trouble-maker head pin.. I carefully unwrapped it, but most of the wire was damaged beyond use and just broke off. I was left with about an inch or so of useable wire; enough to make a small wrapped loop. This is all I had left, in the end. Sigh. The head pin on the left had to be tossed. I trimmed and tweaked the wire a bit on the other one and decided I could still use it as an accent dangle. So I started over and here’s what I came up with. 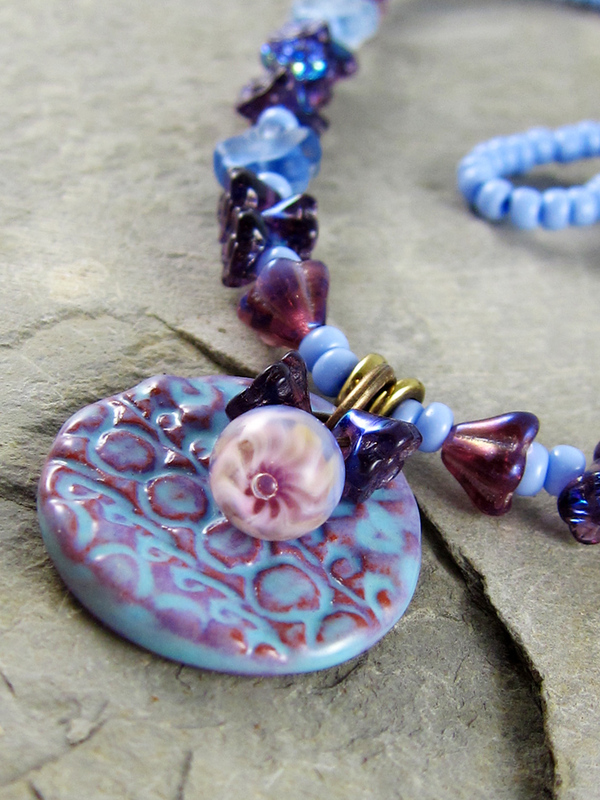 I named the necklace Periwinkle Surprise, because the result was not what I had planned at first. 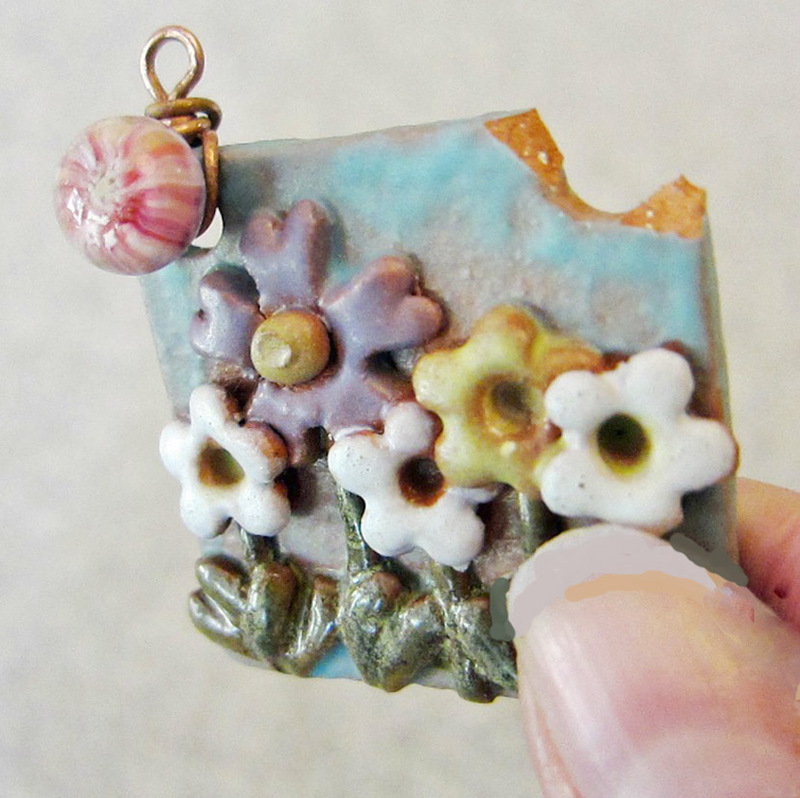 I must say that Jen’s head pin looks very pretty with this ceramic pendant by White Clover Kiln. 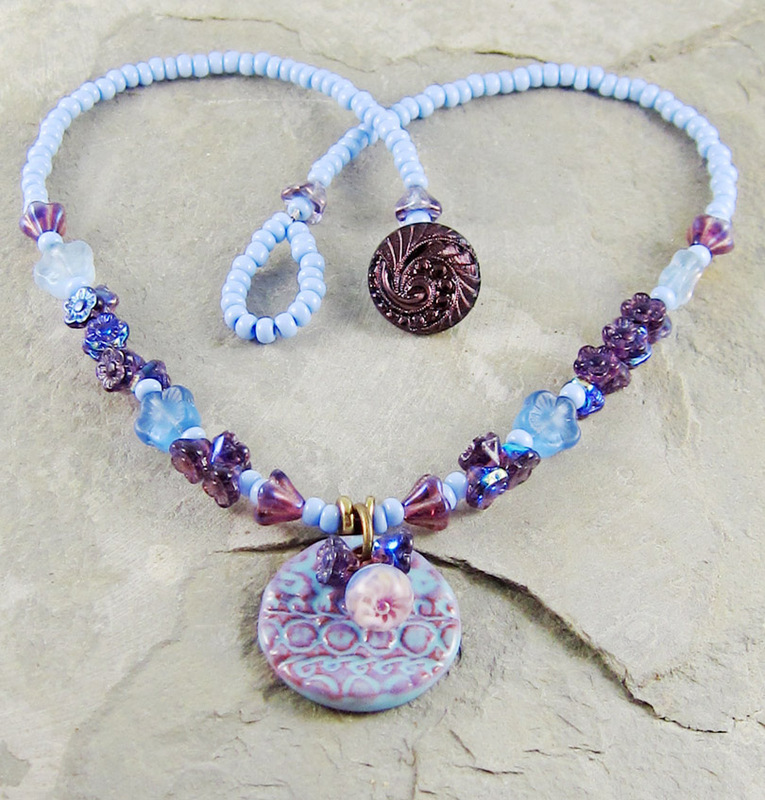 I finished the necklace with a gorgeous Czech glass button and loop closure. P.S. When I told Jen about my head pin disaster, she sent me this picture, via Facebook! Just had to share it! Want to see more gorgeous head pin jewelry? 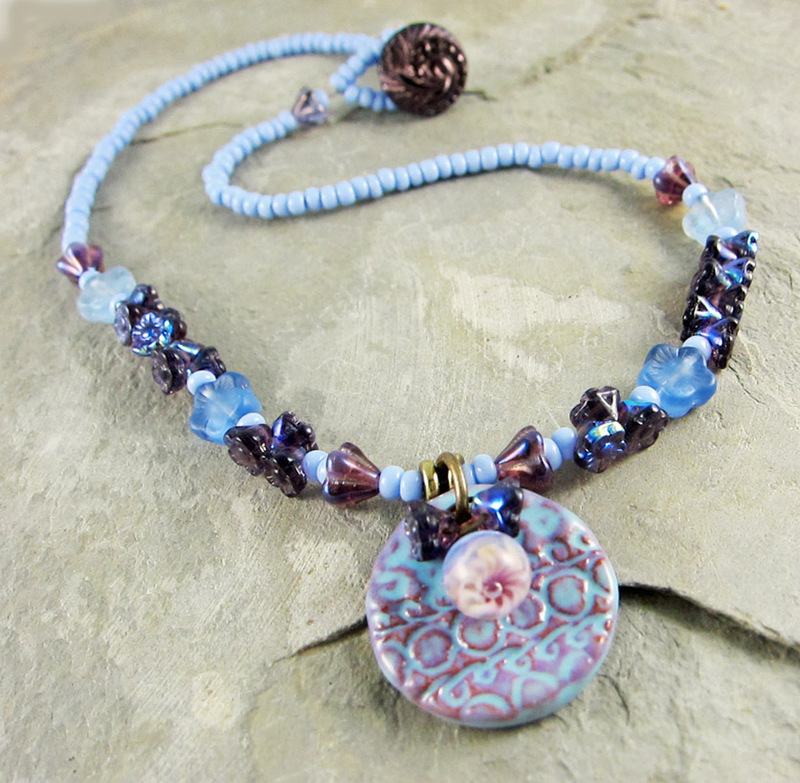 Head on over to Art Jewelry Elements for links to the other Component of the Month blog posts! 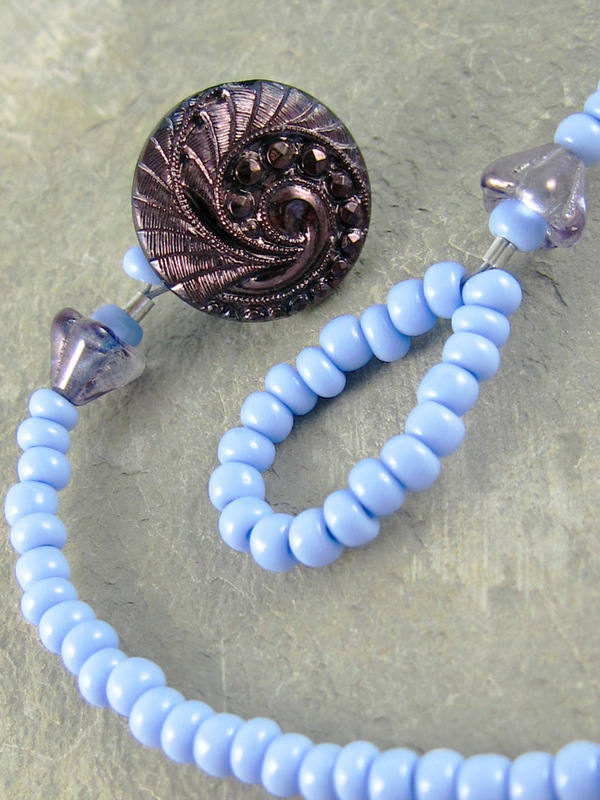 This entry was posted in Bead And Jewelry Challenges and tagged Art Beads, Art jewelry, Art Jewelry Elements, bead blog, blog hop, Component of the Month Challenge, failure, fashion, Jen Cameron Designs, lampwork head pins, Linda Landig Jewelry, necklace, White Clover Kiln by Linda Landig. Bookmark the permalink. Oh dear Linda what a terrible shame and such a pretty pendant….Is it repairable so you could at least wear it yourself? 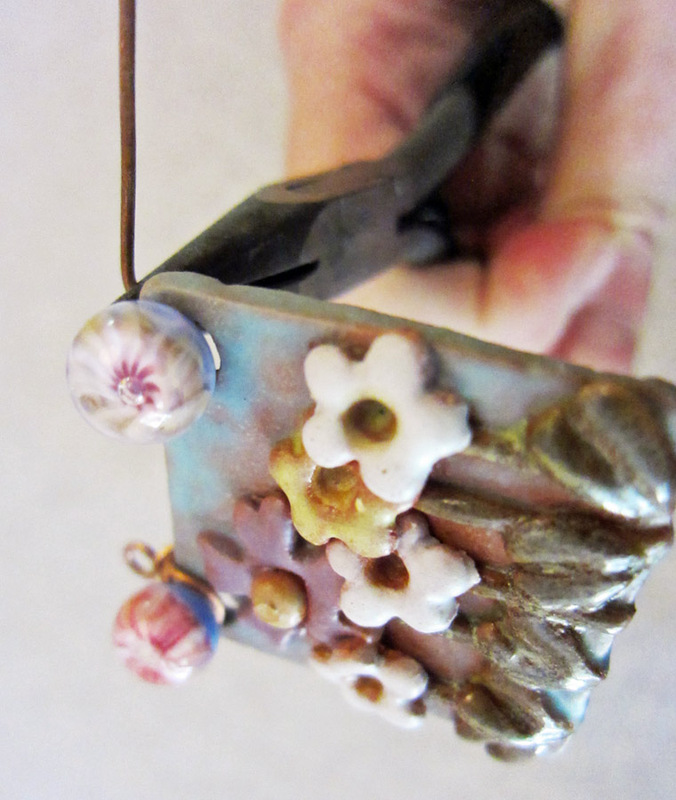 I actually mention the trials of Decorative headpins in my post and have to admit they do make me nervous. Your final piece is very, very pretty though and the remaining pin is a perfect accent. When I read your blog post, I felt much better, Lesley. Your “been there, done that” comment made me feel like I wasn’t the only one! I love the earrings you designed with your head pins! I’m sorry for all you went through but really the end result is gorgeous!!!! Be proud that you kept going and finished the challenge without throwing in the towel. As usual I was timid in my use of the headpins for the same reason as what happened to you, and in the end was not as happy with my use of these gorgeous headpins. Next time I’ll be more couragous! That is a shame, that was a beautiful component. But you pulled it off with what you had to work with and it’s beautiful too!!! Oh Linda, I just about cried for you! Your end result is just lovely…thanks for sharing your struggles with that naughty headpin. LInda, I was about having palpitations while I read this sad tale. Truthfully, I have broken so many pieces of Greek ceramic during wrapping, but I blamed either the delicate components or my heavy hands. 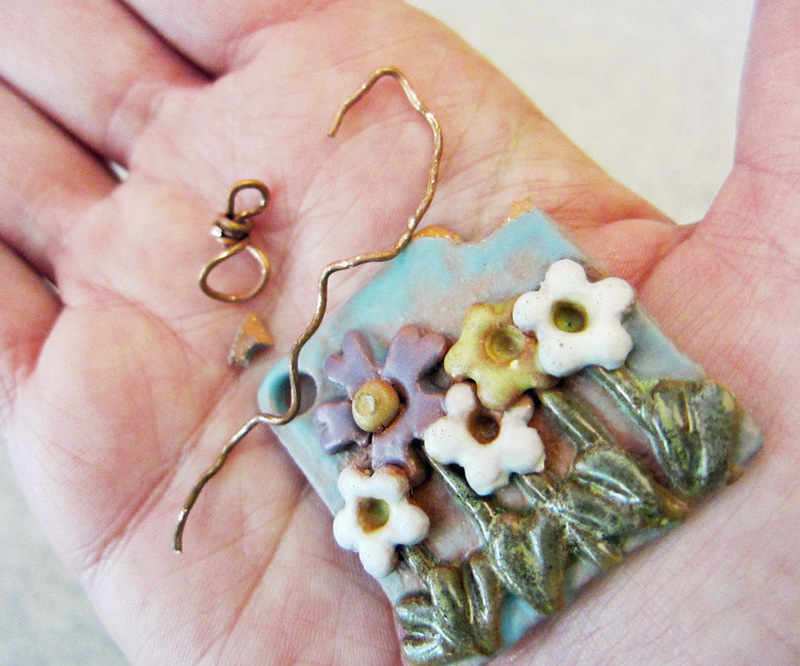 Could either the ceramic or the headpin be wrapped in filigree or beaded into a bezel? That is a whole other topic, isn’t it? Oh well, at least one headpin survived to grace your sweet necklace. Thanks for being brave enough to share the lesson with us! Oh Linda! 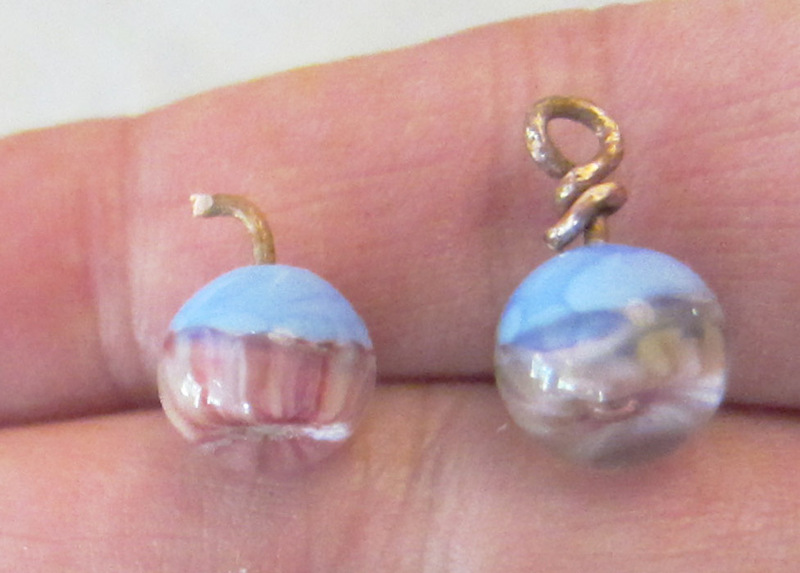 I was so excited to see the process, and then the ‘gasp’ when I saw the broken pendant! I’m so very sorry, but I have to say, you definitely made some beautiful lemonade with your necklace! It truly is a gorgeous piece. OOooohhh man, how I feel your pain! And such a gorgeous pendant, too – – that you’ve been saving for so long and waiting for just the right accents and inspiration. Gaaaack!! I, too, said out loud, “OH NO!! !” when I got to the sad part. Just yesterday I was making a bracelet with 6 [only!] lovely Czech glass beads I bought for this purpose, and as I was tucking in the tail of the loop of the wire-wrap, I heard a little “crriick” sound. Uh-oh!! I stopped immediately and decided to clip off the rest and file the little poke-y end instead. Near miss. Love your end result, though! Your beautiful Periwinkle Surprise would probably never have happened without your “disaster”! I just about cried when I saw what happened but I have to say you really came through with a gorgeous piece!!!! 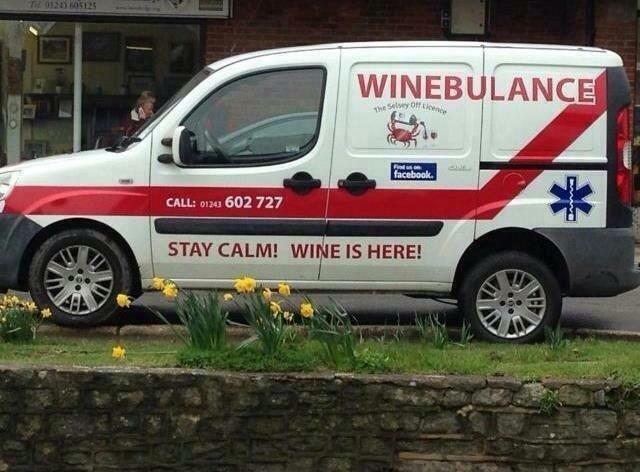 I love the Winebulance! Could you send it to me? What a shame, Linda! It was a gorgeous pendant, but I love the necklace you came up with at the last minute! I would cut the wire on the other one flush with the glass and glue it to something!! I am really impressed that you kept going. I may have gotten frustrated enough to throw my hands up… I love the original idea and I am sorry it wasnt meant to be. The new piece is lovely – great colors, and the Murrini is perfect with Mary’s ceramic piece!!! When Life hands you lemons…. Sorry about your accident but your save was excellent! I really love your necklace! What a trip down memory lane this story was for me. I’m quite sure that pendant was made in 2007. I thought at first when I read the beginning of the post it was a piece by Jennnifer until I realized you were giving credit for those cool head pins. I kept looking at that and thinking…I made some pieces like that back in the day! I bet you got that from Allene’s Beads at a west coast show. She was from Springfield MO, but lives in LA and did shows out there. They were part of my ‘coloring book’ series..very primitive simple designs. I no longer work in earthenware clay which changes the glazes, but stoneware and porcelain are much more durable. 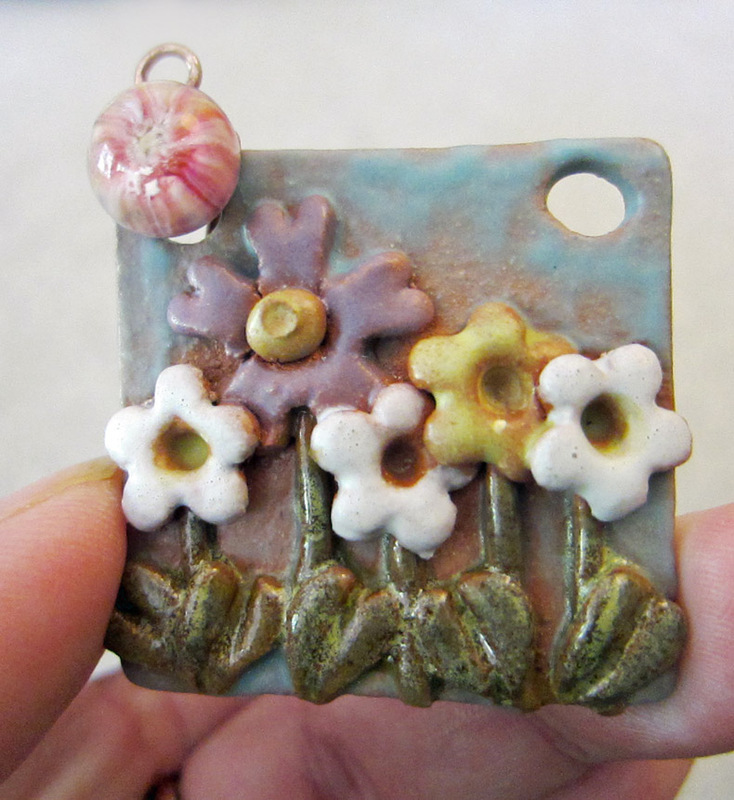 I will piddle next time I have the clay out and see if I can create something with similar flavor. What a bummer! I probably would have cried and given up. I love that you kept going and created such a beautiful piece. Hello neighbor! I live just 15 minutes away from the Shipwreck store/warehouse! Lucky me! 😀 Thanks for visiting my blog! I love your work, Linda! You have such a great eye for color. I’m following your blog and can’t wait to see more of your great jewelry!